"I'm Bored! ": Find out what this mom did to banish boredom! “I’m Bored”, we’ve all heard it before, I was sick of it so I stopped everything I was doing, sat down and designed THIS. My kids will never be bored again! If you have been following my blog or subscribe to my newsletter, you will have seen that we are currently trying to sell our house. This means showings, always keeping our house clean, and being ten times more organized than normal. The shift from our normal existence in the land of “lived in chaos” has been challenging for the kids and as I have packed up most of their toys (it’s summer! They should be playing outside ;)) I heard the inevitable “I’m Bored” for the very last time! 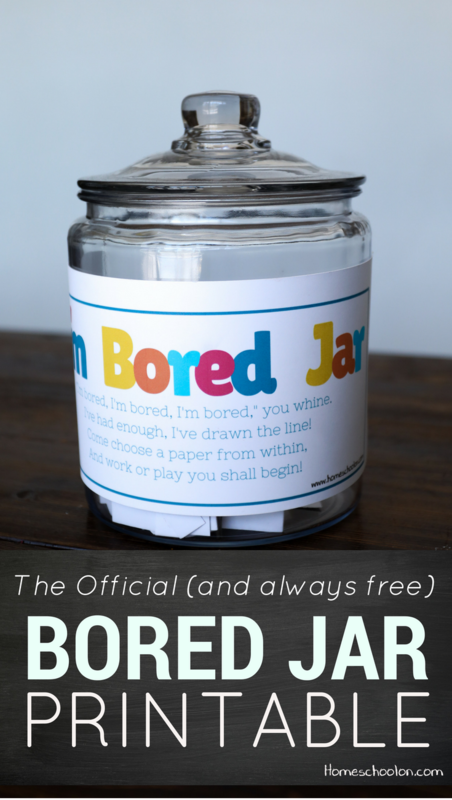 Get your free Bored Jar Printable Here! I stopped everything I was doing, called everyone to gather my supplies (pen, scissors, glue, a jar, etc.) and made an impromptu “I’m Bored” jar. I like to call it the “Russian Roulette of Boredom.” Half the entries are chores, half the entries are imaginative inspiration such as play hide and seek, make up a song and preform it, make a fort, or write a card for someone, etc. Then I figured I may as well put it together as a printable for other people to use too! And voila, the “I’m Bored” jar was born, complete with a cute little poem I wrote for the occasion. Simply fill in your name and email and you should receive the free printable within an hour! Please do not share this download link with anyone, if you want to share this, you can pin it above or use the handy share buttons at the bottom! The results have been phenomenal. The kids want to do it because it feels like a game, I no longer hear “I’m bored”, and when they do get a chore (which is often) they do it laughing all the while, finishing it fast so they can try again. SUCCESS! What are you going to use your blank papers for? Chores or activities? Comment below! I LOVE THIS!!! !Thanks so much, printing it off right now! I found it in my email inbox! Thank you for sharing!! I love this. We have done this in the past. Always good to get fresh idea’s though. I’m gonna send it to my sister as well who just had a baby. She will need this this summer when she is feeling over tired and not creative. Thank you. We had something similar when my kids were younger, but with all fun activities to do together. I love these. I so do not want to hear the word bored, ever. Thanks for posting. Hello from Favorite Things Friday. I absolutely love this but there is not a link for me to download it. I have subscribed to the list so I don’t know why it doesn’t work. I love, love, love this idea! This is much more fun than my standard reply which is to come up with a chore for them to do. As you can imagine, while that answer keeps them from complaining to me, it also results in a lot of tv/video game zombie behavior. Definitely doing this! Thanks for sharing it at the Happy Home Life party. Many homes will be much happier this summer as a result! The bored jar link is not showing up.Is there another way to access this? Hi Shari, I changed it today to just click on the image and hit download rather than having to subscribe 🙂 You should be able to access it now, sorry about that! It sends it to you once you confirm your email subscription. Check your junk mail and add rebeccaspoonerpgblog@gmail.com sometimes it takes an hour or so. But it will come right to your email address 🙂 Thanks! I love this, and your blog! Thank you. I wanted to bring to your attention that there are a few typos, but only to be helpful…not critical. They sneak by so slyly, like kids in a cookie jar. ? Clean the litter box, pick up the dogs doody in the yard. Great ideas! Thanks for commenting! Love the idea so much. Greetings from Romania! Thanks so much!!! Girls are driving me nuts today! I am a former preschool teacher (now retired) and could I have used this when my kids were growing up. I now have 1 niece and 2 nephews that are growing fast and will be making this for them. Love to pass on useful things to make their lives a little easier. I would like this exact one but with chores on it…. so if the kids are naughty or want something i can make them choose a chore first. if you could create that exactly the same i would love it. Thanks for sharing it at the Happy Home Life party. This looks great. I cannot wait to use it with my granddaughter. Thank you! I have been blogging for two years now. Do you prefer to glue them to craft sticks or laminate and keep as little rectangle tags? FYI – Misspelling of ‘you’re’ on the “I’m Bored Jar” suggestion of ‘Pretend your on safari’. I’d print out my own version with “you’re” spelt correctly in the safari option, as I think grammar is also important…. Hi, I love this idea but I can’t get then download. I’ve entered my name and email address 3 times and I’ve had nothing. Could you please help? Thanks in advance. I love this idea!! It’s so cute and will definitely keep my kids occupied. Thank you!